Certified by the American Board of Plastic Surgery, plastic surgeon Daniel C. Mills, MD offers a comprehensive range of cosmetic breast surgery procedures that can help you attain your goals. Please follow the links from the list of options below for more information on specific treatments, and contact our practice to schedule a consultation for procedures such as breast enlargement, breast lift, breast reduction surgery, and more at our Laguna Beach, Orange County, California practice. Breast augmentation is designed to add volume and fullness to the breasts with breast implants. Dr. Mills performs a special technique for this procedure which can result in less visible scarring. Breast implants come in a variety of sizes, shapes, and types. Dr. Mills performs breast augmentation procedures with state-of-the-art implants that can give you beautiful, natural-looking results. Gummy Bear breast implants are an innovative type of implant designed to retain shape and both look and feel like natural breast tissue. Available only to board-certified plastic surgeons, Sientra® cohesive gel breast implants can provide natural-looking breast enhancement results that complement the unique contour of your body. Breast lift surgery, also known as Mastopexy, address excess skin in the breasts that may be causing sagginess. This procedure can give the breasts a firmer, “perky” appearance. A breast lift with implants procedure, medically known as augmentation-mastopexy, can add significant volume to the breasts while creating a firmer, more youthful appearance. Breast reduction surgery can eliminate excess skin and fat in women who are suffering discomfort and embarrassment from having breasts that are too large for their body frame. Male breast reduction addresses a condition called gynecomastia in men, which can cause excess tissue and fat to accumulate in the pectoral region. Dr. Daniel C. Mills offers advanced breast reconstruction procedures to help women restore the breasts after mastectomy, lumpectomy, injury, or deformity. Breast revision surgery can address dissatisfaction with results from a previous breast enhancement procedure, and serve to exchange your implants for a different size, shape, or type. A Mommy Makeover is a combination of cosmetic enhancement procedures designed to help new mothers restore their bodies after pregnancy and child-rearing. This new technique in breast augmentation can add fullness and volume to the breasts utilizing fat and stem cells collected from another area of your body to produce larger breasts without implants. Please contact our practice for more information on breast enlargement, breast lift, breast reduction, and other procedures from our plastic surgeon. 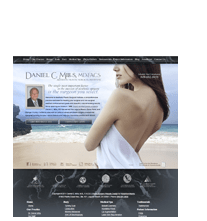 Also, if you would like more information on breast enhancement, body contouring, facial rejuvenation, and the many other aesthetic treatments available from Dr. Mills, please visit our main website at www.danmillsmd.com.